Now is the time to get records up to date for the end of the calendar year, ready for tax planning. Why? Items from the past six months will be fresh in your mind so you can make notes and reconcile your accounts. 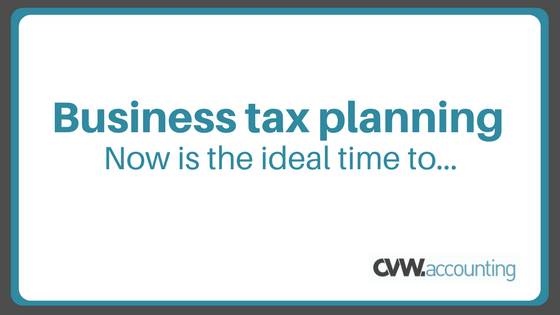 With everything up to date you will be ready to meet with a member of the CVW Accounting team in January or February to look at your business tax planning for the coming six months and financial year. The advice we provide clients is included in our fees and our fees are agreed upon before we start work. Whether our clients visit us once or twice a year for advice and business tax planning, the cost is usually the same. We are highly experience at what we do, thus a quick review of information by CVW Accounting staff often identifies major or minor issues that require attention. Our proficiency often saves individuals and businesses a lot of money. Owners can miss identifying an issue when they are so focused on working in the business. Businesses aim to make money. As a Director if you cannot afford to take out a wage or your reward, then perhaps you have too much stock, the business may not be invoicing frequently enough or you may need to change your terms of trade. As Accountants, we provide business advice and can easily tell by looking at the numbers if something is wrong. As our Director Stephen Vining explains, after decades of providing business advice he can quickly ID issues, problems and where the money is going. “We can walk into our clients work place and before even looking at the books we can see items that need attention and action,” he said. When the end of the calendar year approaches, consider scheduling time to get your business accounts and records up to date. Then drop CVW Accounting a line to book an appointment in the new year. This entry was posted in Advice, Business Plan, Business structure, Planning	and tagged #accountant, advice, CVW Accounting, end of calendar year, information, perth accountant, tax, tax planning .